Version 4.2 is now released! We are pleased to offer the latest update to Xact Link for Act! and QuickBooks, version 4.2, which includes substantial feature improvements. The update applies to USA, Canada and Australian and New Zealand versions of the software. New features include Completely NEW process to create PDF documents from within Act!, NEW ‘Invoice Copy’ process, NEW Quick-Link facility to match and link vendors, and Price and Cost information has been added into the stock module. All within Act! contact records, for quick viewing, lookups and analysis using Act!. Click here for a full description of the NEW Features! The Xact Link for Act! and QuickBooks is the original and only live connection to selected QuickBooks accounting products* for Act! Pro and Premium. Your customer-facing staff and sales people can access sales data, check customer balance and even create invoices, sales orders, estimates etc. - all from within Act!. A complete workflow solution with no need for QuickBooks to be installed on the users machines, saving you the expense of extra QuickBooks license. Click View Live Demo to book an interactive demo on our machine for no-fuss - no installation required. Ready to test drive the product? Head to the Downloads section below for a FREE 14 days trial; a fully-featured product with simple purchase option, no re-installation required afterwards. * includes Reckon Accounts Premium & Enterprise (Desktop) for Australia / New Zealand market. Create a connection between your Contacts in Act! and their corresponding Customer records in QuickBooks. Create and update customer records from Act! contact. View Estimates, Sales Orders, Invoices, Sales Receipts and Credit Memo in Act! Create and edit Estimate, Sales Order, Invoice, and Sales Receipts*1 directly in Act! Report on key Customer Account information from within Act!. View a list of all the items a customer has purchased and create new transactions based on past purchases. Perform QuickBooks searches for linked Customers/Vendors and Customers with invoices to be emailed, then turn these into Act! lookups. View QuickBooks stock level information and set monitoring alarms from within Act! 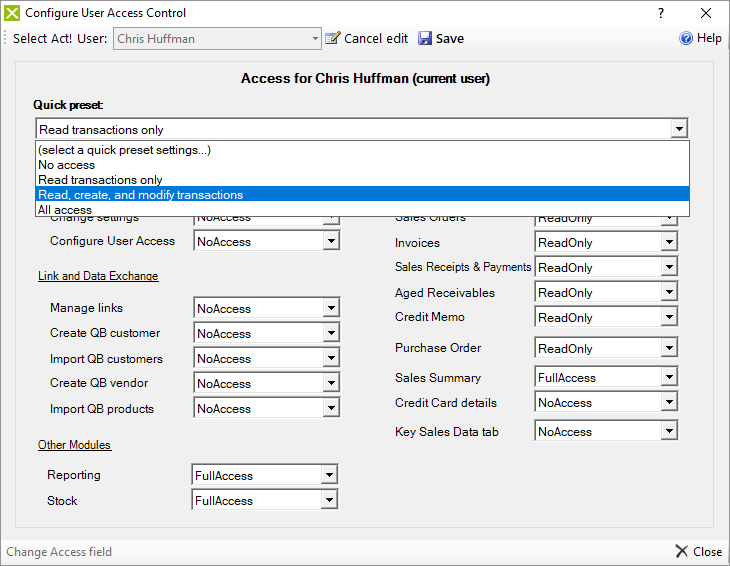 Link, create, and update QuickBooks vendor from within Act! Complete control over what each Act! user can view or perform with User Access Control. Offline Data Mode enables user to access customer information, account information, and sales history "on-the-go" or when working offline (computer is not connected to QuickBooks). Extensive online documentations, covers from setup & deployment to references & walkthroughs. Note the pricing below does not include the Act! CRM software which you will need in order to use Xact Link for QuickBooks. * Additional volume discount may apply; amount is calculated at checkout. Alternatively, you could also book an interactive demo on our machine. Click here to fill in a short form to access our demo server - no installation required!